ROFLMAO – Yep! 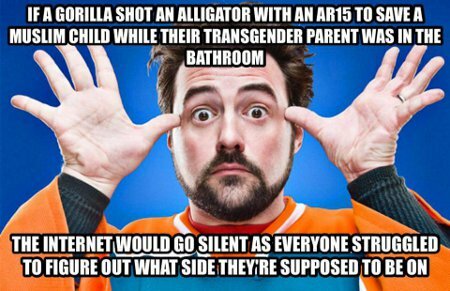 If a gorilla shot an alligator with an AR-15 to save a Muslim child while their transgender parent was in the bathroom it would “break the internet.” Not, mind you, because of the amount and intensity of the traffic, which is what is normally meant by that meme but due to utter, shocked, and panicked silence that would ensue as the Liberal and Progressive SJWs went into hysterical paralysis due to their not knowing who or what to side with. The intersectional conflict that this would generate within the so-called minds of these ever-puling domestic enemies of America would almost instantly reach critical mass as they strove and failed to reach a consensus fantasy of the “proper” hierarchy of “oppression,” privilege, and protection. This entry was posted on Thursday, July 7th, 2016 at 8:39 am and is filed under Humor, Politics, Society. You can leave a response, or trackback from your own site. Lol, this is so true! You hit the nail on the head.